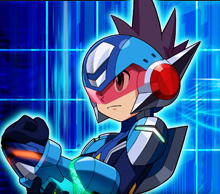 Mega Man Star Force 3: Black Ace and Red Joker are shipping out to distributors today. Copies will be going in the mail sometime now for those who ordered online via Capcom or elsewhere. Those intending to drop by the local gaming store ought to call ahead of time for availability; it's more than likely the games wont be available until tomorrow (Wednesday). In before the inevitable "SSR sux lol" or "why, Capcom, why" or "GIVE ME MY ROBOTICS TIMELINE SEQUELS CAPCOM", etc., etc. you can download SF3 on the net! i played at that on the Emulatori, that game rulz, VOICE IS IN IT! FIRSTE SF GAME WHERE IS VOICE! Dude just came out in stores right now just got it !!!! Black Ace, here I come! Is it ok if I start on RnR 3? This is the only 1 i kinda find appealing. I ordered the special edition of black ace. Cant wit for the game an the kit come in. I've been playing the first two games all day just to stay calm. Supposedly some Wal Marts already have the game on shelves, but I preordered and payed it off already at Gamecrazy so Im just waiting for them to open. About time. Been looking forward to this for a while. wow! i can't wait to get it! will this be the reason why i swtich to a ds? They have Harry Potter 6, while they don't have Red Joker. I'll get it in stores tomorrow. I thought online orders were slower. Yep, I haven't gotten the call yet so even the one I reserved isn't in (though they may call me tonight). Just keep checking their site, this is just shipment date. I hope Shido isn't called "A.C.Eos". Seems so long ago we first got the tidbit from SSR3. Will the wait be equally long for OSS? Not to hijack the comments. :) I'm happy it's been released. I PREordered Black Ace, but it's on backorder anyway.. Seems weird to me. Anyone know if they made less of these games due to the decreasing popularity of the series? Kind of how MML2 is harder to find than MML1? Gave my local gamestop a call, said they won't be getting their shipments till tomorow. Guess I'll wait another day. I'm sure they always take sales figures of previous entries into account Hypercoyote. Whether it significantly changed the amount they produced is anyone's guess but it won't be hard to find. My Gamestop doesn't have it in stock yet ;. ; I have to wait till tomorrow for my Pre-Order to come. i dont really see this as a spoiler, but the game has mentioned so far netfrica and sharo, and 'tomahawk', references to rockman.exe? maybe for the new exe game? I doubt they'd put any references in the game since it was developed a little while ago. RnR is in the same universe so naturally exists on the same planet as EXE.